This is another "I don't want to go to the store" pantry and fridge soup creation, tossed together when a craving for something Thai-inspired struck. Although I like edamame in this one, really any frozen veggie will work--peas, broccoli, corn, cauliflower. I pretty much always have lemongrass and ginger around, kaffir lime leaves in the freezer and coconut milk in the pantry. Smooth and creamy, this one can be served at any temperature depending on your mood. *Note: If you can't find kaffir lime leaves and lemon grass, substitute 1/2 tablespoon each lemon and lime zest. In a stock pot, heat olive oil over medium heat and add shallots, garlic, ginger, lemongrass, chile and kaffir lime leaves. Saute until shallots are softened and translucent--about 4 minutes. Pour in the vegetable broth and tamari and bring to a boil. Reduce heat and simmer about 10 minutes. Return to a light boil and add edamame. Reduce heat and cook for another 10 minutes. Remove from heat. Place mixture in a blender, add Thai basil leaves and blend until completely smooth. (Note: let soup cool or do this in batches if you do not have a high speed blender.) Return to pan and stir in coconut milk and lime juice. Heat on low and simmer about 5 minutes to blend flavors. Adjust seasoning with salt and pepper as needed. Serve warm or at room temp, or chill overnight for a cold soup. Garnish with a slice of lime and a couple Thai basil leaves. Enjoy! Notes/Results: Simple and full of good flavor. The lime juice keeps if tasting fresh and bright and the chile adds a zing--you can adjust both to your liking. I ate it as a starter to some store-bought poke (Hawaiian raw fish dish), but it would be a good way to kick off a Thai-food meal. I will make this again. We have some good friends waiting in the Souper Sundays kitchen--let's take a look. 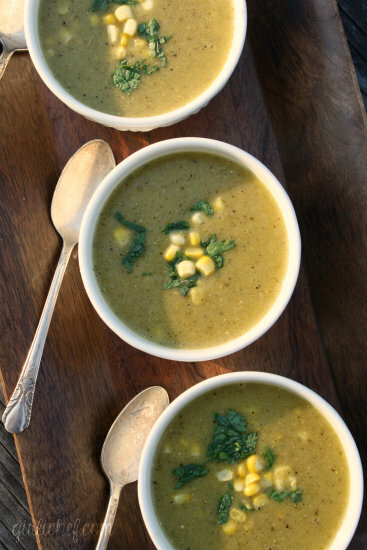 Heather of girlichef is a summer soup girl after my own heart with this Emerald Corn Soup from Rick Bayless. She says, "If ever there were a soup indicative of summer, this is it. Fat, juicy kernels of sweet corn stripped from the cob. Tomatillos hanging like little lanterns from the plant, just waiting to be removed from their papery husks. The seductive heat of emerald green poblanos mingling with the bright heat of jalapeños. Yes. That would be summer in a bowl.I can hear the grumbles now. It's summer! Why would I want soup in the summertime? Well, durnitall. 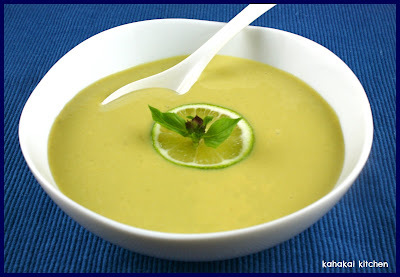 If I've said it once, I've said it a million times - soup in the summer is a good thing!" 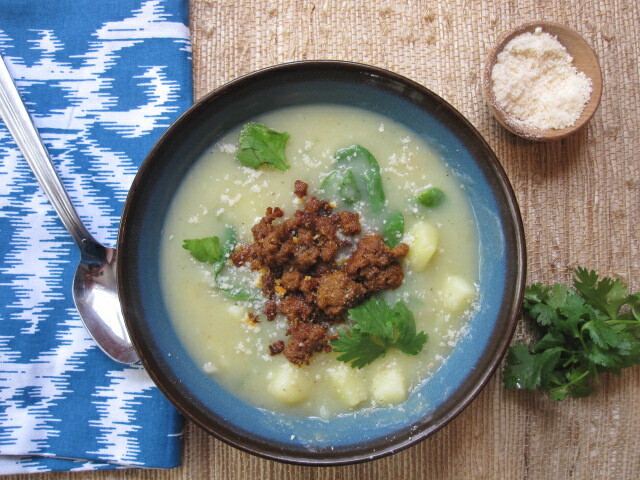 Kim of Stirring the Pot tried Rick Bayless' Roasted Jalapeno Potato Soup with Greens and Chorizo and says, "This potato soup differs from the traditional cream and cheese laden potato soup. This is a chicken broth based potato soup. It has no cream or butter and only uses a small amount of cheese as a garnish. Surprisingly, this potato soup is every bit as creamy and delicious as it's calorie-laden counterpart. We loved the heat from the jalapeno, the healthy addition of greens, and the gorgeous and flavorful chorizo topping. My husband, who isn't a big soup fan, enjoyed two bowls. It was a hit for sure!" Help me welcome a first-timer to Souper Sundays, Jessi of What's Cookin' SMA?? ?, here with a version of Posole Rojo. She says, "Known as a hangover cure for those not wanting Menudo, you can usually find it at your local Taqueria on Sundays. But it is relatively easy to make at home, most of the time is spent in letting it simmer away. ... The basics of posole are this (for any color) meat rich broth, chilies and hominy. 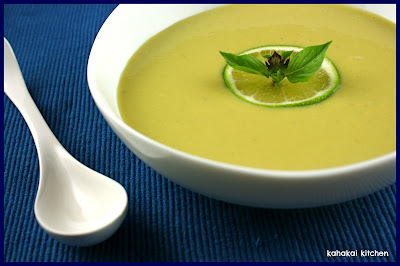 Remembering these three things, you can make your own recipe any way that you like." Welcome Jessi! It's a salad week for Janet of The Taste Space--she made three this week. Her first is this pretty Salad with Roasted Strawberry Balsamic Vinaigrette. Janet says, "Fresh strawberries are delicious and their sweetness is intensified with the caramelization from roasting. While I have baked and macerated strawberries before, I never thought to roast them. Here, they are combined with balsamic vinegar and hazelnut oil with savoury undertones from thyme, rosemary and garlic. Serve it with your favourite greens." Next Janet made a Blackberry, Avocado and Walnut Salad with a Ginger Lime Vinaigrette. She says, "...And now blackberries. With avocados from the week before. And walnuts from the pantry. These ingredients, alone, would be a great combination of sweet, creamy and bitter… but then it is drizzled with a sweet ginger lime vinaigrette. I didn’t think it would be so flippin’ fantastic, but it was." 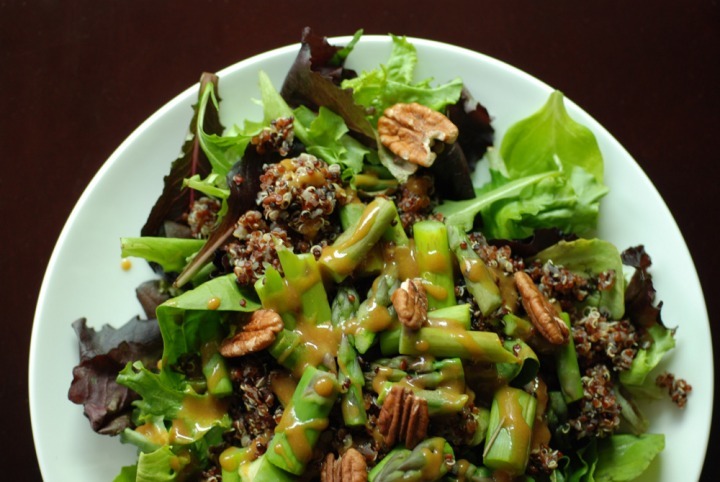 Finally Janet tried this Asparagus Pecan Quinoa Salad with a Maple-Mustard Dressing and says, "My latest kick is adding quinoa to vegetable sides to make it a more sustaining meal, and here I go again with this salad. This would be a delightful salad without the quinoa, too, as it highlights the crisp asparagus and colourful baby greens with some crunch pecans. 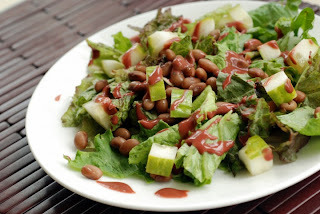 The dressing, a maple-mustard flavoured one, definitely brings the salad together with the tang from the soy sauce, the sweetness from the maple syrup and the deeper flavour from the mustard." 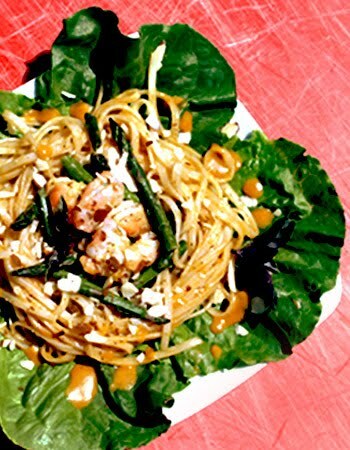 Margo of SaucyCooks.com is back with this colorful Basil Apricot Noodle Salad with Shrimp and Asparagus. She says, "I opened my fridge and rummaged through to see what I could use, pretending the whole time that my fridge was a box of ingredients and one of the mandatory ingredient was apricots. What I emerged with was asparagus, some shrimp and some lettuce, all of which were begging to be used. So far, this was a much easier challenge than anyone on ‘Chopped’ would face. 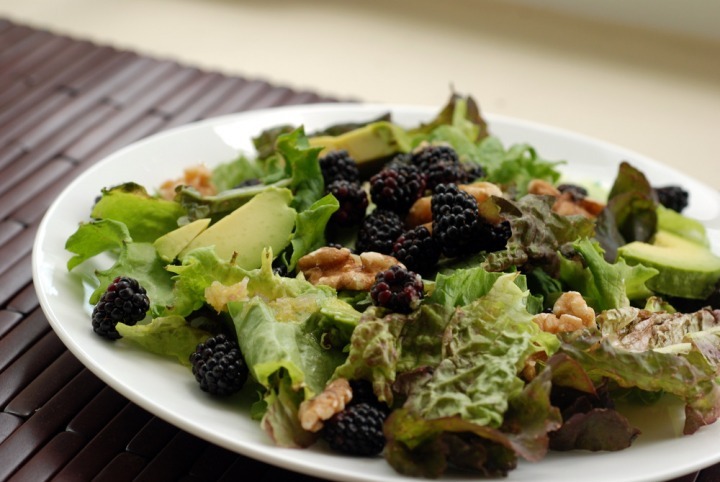 The salad that resulted was delectable and hit the spot." 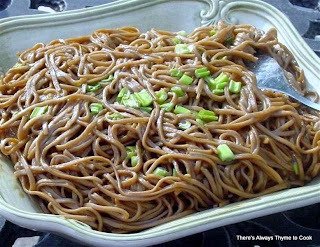 Also getting "noodly" with her salad is Carol at There's Always Thyme to Cook... with this summer-perfect Spicy Cold Soba Noodle Salad. Carol says, "Hot days call for cool things. 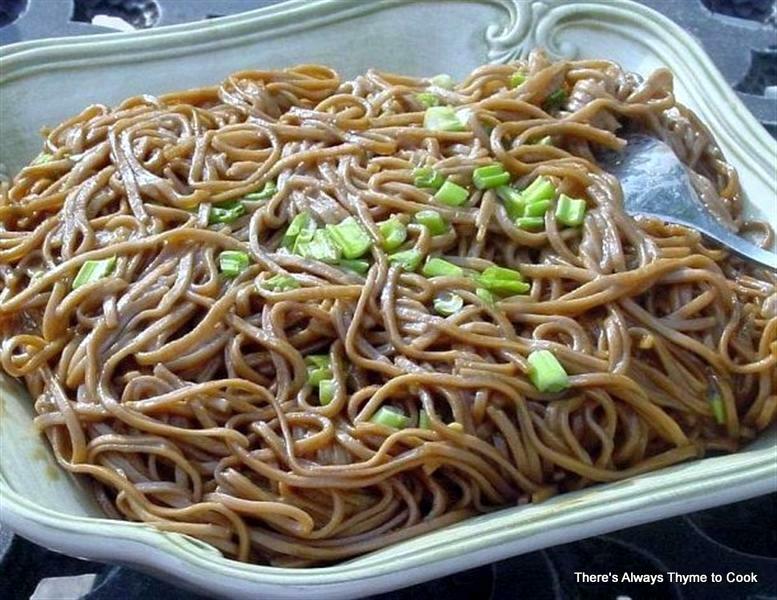 This is a repost of one of our favorite cold noodle dishes. It's hot spicy but served cold." 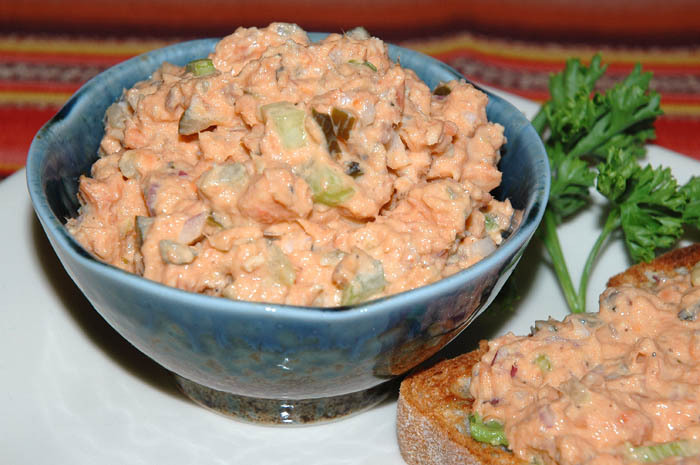 Debbie of Easy Natural Food made Salmon Salad Spread this week and says, "I cannot stress how much I LOVE this simple salmon salad. I make up a batch and it lasts me for lunch 3 days in a row. I actually do eat it 3 days in a row, because I never get tired of it! It tastes so moreish, one mouthful leads to another, and another…but it’s good for me, so no guilt there." Finally, we have one sandwich creation, these tasty Chives Omelette Quesadilla Wrap/Roll-ups by Tigerfish of Teczcape-An Escape to Food. She says, "This quesadilla wrap, roll-up sandwich is super-easy to make, healthy and nutritious too. 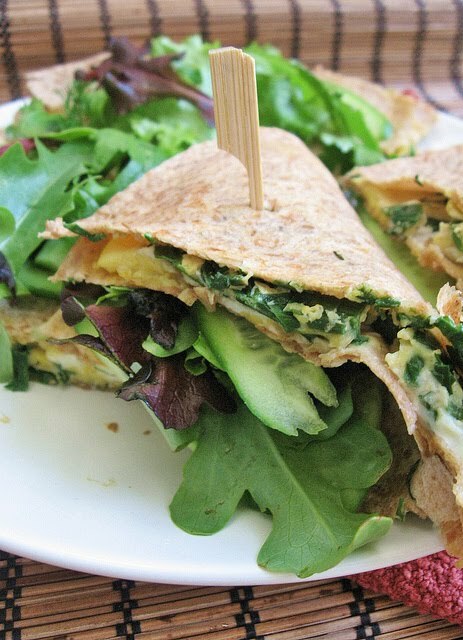 With the chive-egg omelette as the main filling, it is definitely flavorful. Yum!" 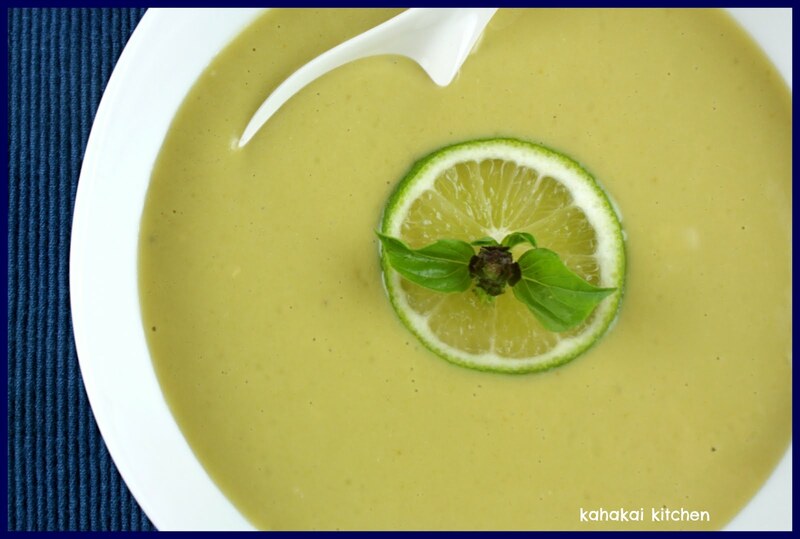 Some fabulous recipes this week--mahalo to everyone who joined in. If you have a soup, salad or sandwich that you would like to share, just click on the Souper Sundays logo for all of the details. I actually almost always have frozen edamame around. I love the thai flavors in here...and will definitely be making it soon! I love the flavors in the soup, and love that it's delicious hot or cold! 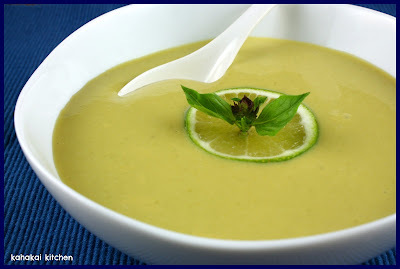 Oh my gosh, that soup looks so creamy and delicious and perfect for Summer. And I think it fits as the starter for some Poke. Beautiful. And great roundup this week - so many selections! Oooo yummy, Thai flavors! Looks so silky smooth as well. Awesome soup!